Haunting Hoothoot! Pokemon One a Day, Series 2! You know how Pokemon names come from the fact that they say their name? 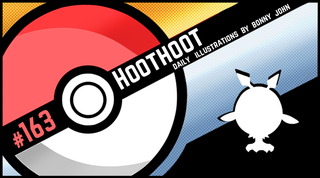 I think Professors of the Pokemon world dun goofed when it comes to Hoothoot. Where'd they get their degrees from anyway? Instead, I propose a new name for this guy: Schmoopie. What does it mean? 'Cute fat round little owl thing' in my own made up language of course. Hoothoot is a favorite of mine, mostly because I think owls are such strange but interesting looking birds. They symbolize wisdom in the modern day, but were mostly signs of peril and ill fortune in the past. Hoothoot as everyone knows clearly symbolizes pudgy adorableness and so I went with something round and sketchy for today. My keyword was "wispy". With gen 2, there was a chance to explore the types that didn't get as much love in gen 1, and Nintendo botched it. I think a ghost owl type would be soooo badass. I decided to bring some wispyness to the fact that this is a night creature and created lines that were a bit rampant without going to gothy or anything along that path. Instead, the work is still colorful as I tried to instill hues of the night and otherwise. A greenish blue tree branch, purples for shading, blue of the moon on its beak...All of these adds up to an interesting palette of colours that I never really put together before. It creates a fun little illustration of an owl who looks like he needs sleep! You're trying to go to sleep, but a Hoothoot keeps waking you up with its constant...uh, hoot hooting. It turns out that he's got a vendetta against you because you don't wear enough deodorant and stink up the forest. What's your cologne/perfume of choice?